The Sagro Mountain region and Ait Ouzzine is the ancestral village of the Ait Atta a Berber tribe which resisted the French up until a treaty was concluded 1933 and never submitted to Thami El Glaoui Pacha of Marrakech during the French protectorate 1912-1956. The Ait Atta belong to the Ait Atta Confederation which covers Ouarzazate, Errachidia, and Azil Provinces. The tribe existed prior to the Arab Islamic conquest in the 7th century and was the leading Berber tribe between the 15 and 19th century. Fiercely independent, their stronghold was the Saghrou Mountains which surround Nkob and its villages. A trek in the Sagro Mountain region includes a five day treks tarting from the Dades valley via the Saghrou Mountains to Nkob. You can also visit the Valley of the Roses on the high plateau of El Kelaa MGouna when visiting this region as well or arrange a home stay with a Berber family through a reputable Moroccan travel agency that specializes in travel in Morocco’s Berber villages, the Draa Valley and the great South. 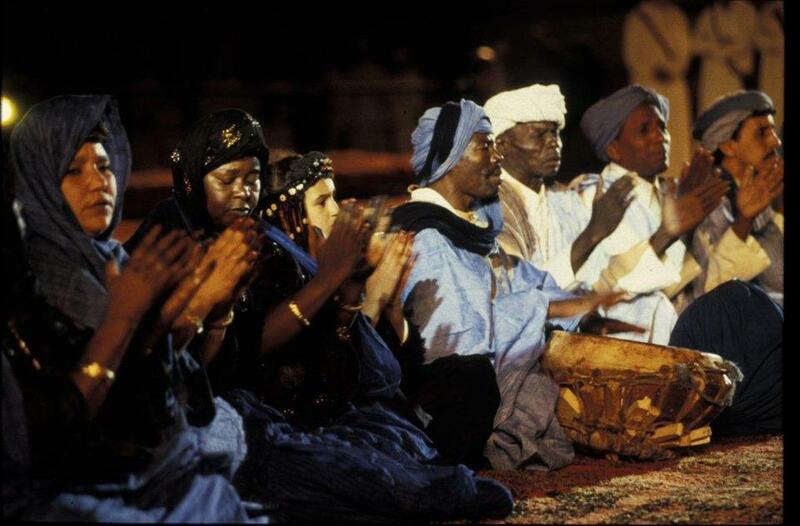 Nkob has 45 kasbahs, a tribute to its ancestral importance and its key role in the caravan trade route with Timbuktu. It reveals much about Berber life and culture in southern Morocco as well as being a tranquil haven and a staging post for trekking in the region and the Saghrou Moutains. The Saghro Mountain region was also once known for having a significant Jewish population. The Jews co mingled with the Berbers and lived side by side and intermarried, prior to the 7th Century Arab invasion. Nkob is located on the road between Ouarzazate and Tazzarine. This is on the southern road which connects Marrakech (340 kms from Knob) with the Erg Chebbi Dunes in Merzouga. Ouarzazate is 136 km from Nkob. 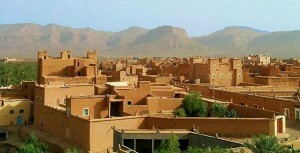 As well as investigating the village of Nkobs’ Kasbah’s there are two surrounding oases. There is a Friday animal market and a Saturday and Sunday Market for local produce. The Nkob souk is the 2nd biggest in Zagora Province. Items include handmade leather shoes and sandals at the Ait Atta Shoes shop. Nkob also specializes in high quality henna as Nkob located in the Zagora region of Morocco where henna grows. Nkob is also known for its organically grown almonds. Other items include berber cosmetics and clothing such as caftans and colorful berber dresses. Restaurants include the Kasbah Ennakhile with home cooked Berber food serving lunch time from 12pm to 3pm and dinner from 8pm to 10pm. At the Restaurant Merzouga you can eat traditional Moroccan fare cooked on a real wooden fire. 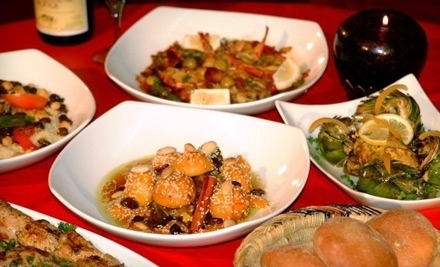 It is a great chance to taste authentic Berber cuisine . Hotel Kasbah Ait Omar, a charming five star well-restored Kasbah located in Nkob with views of the palmeraie and luxuries equivalent to those provided in Imperial City Riads. This quaint restored Kasbah is owned by a German couple who bought the Kasbah from a family and restored it to its original glory. 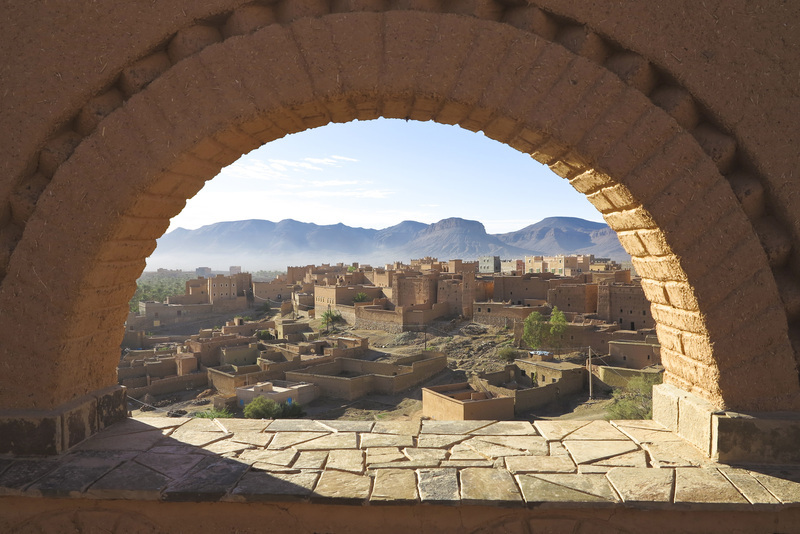 Fitted with a Roman style swimming pool, a glorious hammam, floor heating and charming Berber decor, this Kasbah Hotel is the place to stay in Nkob. A Travel Exploration favorite and the best in the region. Excellent amenities, service, food and location. Ksar Jenna is 2km before Nkob on the road to Ouarzazate and just across from the village Ait Ouzzine. This lovely Riad has a garden setting and rooms built around a center courtyard. Boutique and charming with a small view, the Riad has an Italian tiled and Moroccan decor. It serves as a wonderful place to stay. No swimming pool yet the food and atmosphere make up for it. Midrange traveler option for the region. Excellent food, service and location. The Kasbah Imdoukal is in the centre of Nkob. It is family owned, has traditional decor and a swimming pool. This Kasbah is for those traveling on a mid-range budget and want comforts not provided by for example Kasbah Baha Baha. Good food and location. Kasbah Baha Baha is a restored 10 room Kasbah with a restaurant and swimming pool on the road to Saghrou. It is family owned and reasonably priced for those traveling on budget. There is an option to sleep in a standard room within the Kasbah or a Berber tent. Good Budget traveler option in the region. Good food and location. Guelmim, famous for its blue people and as the gateway to the Sahara is in the South west of Morocco. It is the capital of the Guelmim-Es Semara region which includes Southern Morocco (south of the Souss-Massa-Draa region) and northern Western Sahara. It can be reached easily by road from Agadir. It’s a walled town with houses built of red clay and is encircled by date palm groves. It was a camel caravan trading centre linked to Timbuktu in ancient times and in the 19th century, and it remains a commercial gateway to Mauritania. 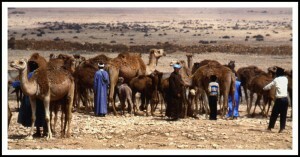 Guelmim is home to the biggest camel market in Morocco which is held every Saturday at daybreak. 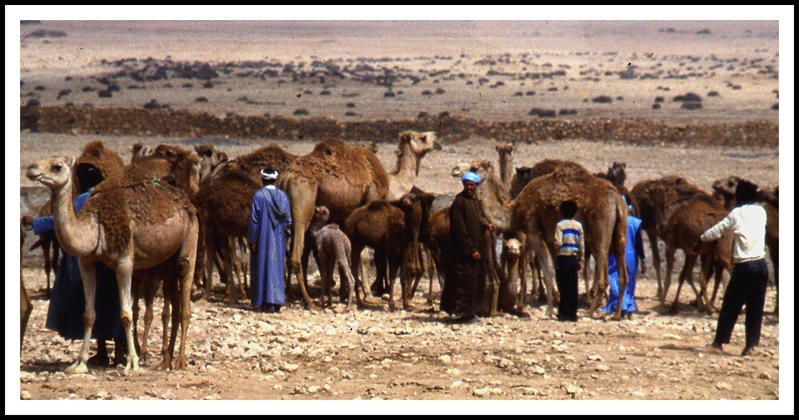 Nomadic camel herders are still common. 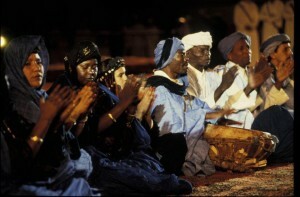 There are a number of tribes at the event including the Regeibat , Aït-Moussa-Ali, Aitoussa, Azwafits, Aït-Yassin, Aït-Lahcen, Aït-Baamran,Sbouya. The “Blue Men of the Desert” or Tuareg are so called because they wear indigo colored robes and a long blue scarf or tagilmust they use to swathe their heads and faces. The indigo is pounded, instead of boiled, into the cloth. There are also, of course, people pretending to be blue men to attract tourists. 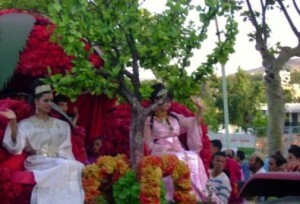 As well as the weekly Camel Fair, the people of Guelmim hold an annual Camel Festival every July. The festival is more of a tourist attraction than an actual market, due mainly to the decline in camel transport and the rise in 4x4s. 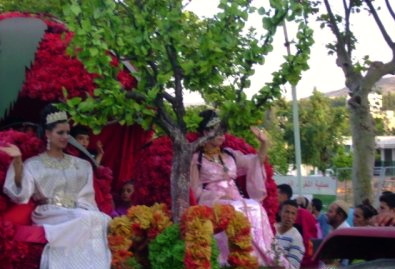 The festival offers the opportunity to witness the ancient dance ritual known as the Guedra, which is associated with Guelmim. The dance is performed by a woman to the beat of a drum made from a kitchen pot (guedra) and the chanting and clapping of onlookers. The dance often induces a hypnotic state. There is a festive atmosphere and meshwi, a whole roasted lamb, is cooked. When in Guelmim, a good place to visit is Fort Bou Jerif, which is the remains of a Foreign Legion fort. This is located in miles of undulating hills and sandy shrubbery, halfway between Guelmim and the Atlantic coast. It can only be reached by tracks and a tour guide with a 4×4 is essential and should be arranged beforehand. As if from nowhere, the Fort will appear, with lovely looking buildings, including a hotel, a motel, a restaurant, a shop, and a camping site. A short drive away is Plage Blanche, a large and virgin sandy beach. An alternate location to visit is at the former Spanish enclave of Sidi Ifni, it has an excellent beach and art deco buildings. Taghazout which is being developed as a major tourist resort is on the road back to Agadir. The lagoon and extensive beaches at Oualidia, lying between El Jadida and Safi, were a well kept secret and a favourite of Moroccans as a seaside venue and a place to unwind. 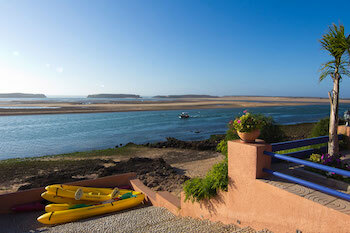 Oualidia is a new Honeymoon Tour destination in Morocco given it’s remote location and romantic surroundings. Over the years Oualidia as a tourism destination has increased in popularity given it offers a beautiful, sheltered natural beach and fishing location where surfing and swimming in it’s blue lagoon are enjoyed by more travelers on a break from the busy streets of Casablanca and Marrakech. Oualidia is also an excellent location for bird watching with pink flamingos in spring and summer, amongst other species. The unspoiled beaches extend for miles and are ideal for walking and horse riding. There is a French run surfing camp for young and old, ideal for families with children. Members of the royal family reputedly learn to surf there. As well as the ruins an ancient Kasbah built by Sultan Al Walid there is the former King Mohammed V’s palace which is now largely derelict. With its mild year-round climate and quiet relaxing beaches, Oualidia is less crowded than the more populated Coastal town of El Jadida and Essaouira. It is more protected from the wind and a haven from the hot and dusty cities given it is less commercialised than other resorts such as Agadir. 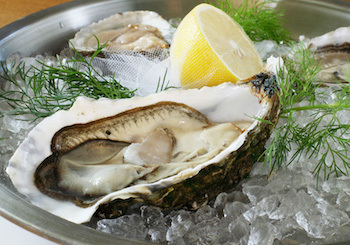 This small coastal town is also famous for it’s oyster farms at Maison Ostrea II. Oyster farming in Oualidia started shortly after Morocco gained independence in 1956 using Japanese oysters with methods learnt from the French. Now rows of oyster beds are spread along the lagoon and are separated according to size. Keen walkers can follow the cliff path for miles above deserted grottoes and beaches. Oualidia is famous for its oysters. You can sample them as well as locally-caught crab, sea bass and sea bream, at one of the many waterside restaurants or freshly grilled on the beaches by fishermen. The Araignee Gourmande restaurant is highly recommended as is L’Ostrea and there are a others including the l’Hippocampe, which is also an hotel and Le Kalypso. There are small hotels including the Dar Beldi which is French run with attractive French Moroccan architecture and decoration and a fine garden. It is about 10 minutes walk from the beach. 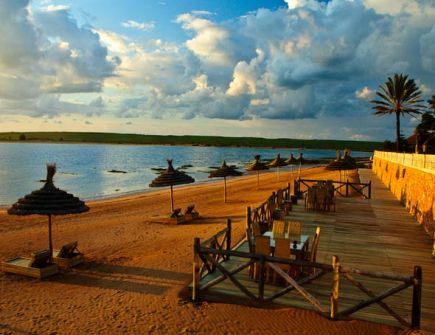 The luxury boutique hotel La Sultana Oualidia is at the edge of the lagoon with L’Hippocampe and the Auberge Oualidia , which offers less costly accommodation. Oualidia has been described as a coastal escape for connoisseurs, with something to offer out of season as well because of its milder climate and the protection from high winds by the lagoon. Lying at the foot of the Atlas Mountains and blessed by the gulf stream from the Canaries which makes for an equitable climate in winter and a cool temperature in summer, Taroudant, with its fertile gardens and palm trees, is an ideal place for a restful holiday. Tarodaunt is just one hour from seaside Agadir and 8 hours from the Sahara Desert region. It has historic crenellated 16th century ramparts similar to Marrakech but without the crowds and frenetic souks and the ville nouvelle. Taroudant is a town mainly located within its ancient walls and its souks are in the two main squares, Assarag and Talmoklate. There is also a weekly souk outside the city walls, near the future university but there is none of the commercialism common in the larger cities. It has the tranquil air of a small market town and its souks offer attractive handicrafts which are much less costly than in Marrakech or Fes, including intricate berber jewelry , terracotta, wrought iron, pottery, brass and copper, leather, carpets and rugs. It is possible and safe to explore the town and its 6 km of walls and ramparts by bicycle. 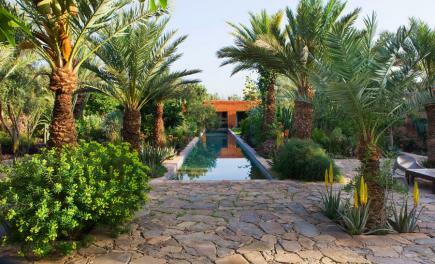 Taroudant has long been the resort for royalty and the jet set seeking a rest at the Gazelle D’Or, a former hunting lodge turned exclusive hotel. 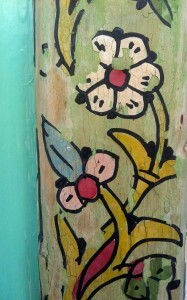 with delightful gardens and bungalows. There are however, also many other accommodation alternatives including a number of riads and guesthouses which offer a range of attractive accommodation options. Riad Hida is near the village of Souss. It has 14 rooms and has an outdoor pool with a furnished terrace and a Moroccan style garden. All the air-conditioned rooms at the Riad Hida are decorated in a traditional Moroccan style. They are equipped with a private terrace and a bathroom. Some rooms have a seating area. Riad Hida’s restaurant serves traditional Moroccan cuisine. Guests can enjoy a drink in the bar or on the sun terrace. There is a palm tree garden with fountains for guests to relax in. Riad Hida provides free parking. It is 30 km from the south of the Anti Atlas and 45 km from Taroudant. This majestic Riad is a former residence of the Pasha Glaoui. Dar al Hossoun is a traditionally built riad, with rammed earth, close to the ramparts and has extensive botanical gardens containing more than 900 different species of plants collected from all over the world by landscape architects, Eric Ossart and Arnaud Mauriere. The property is divided into two, the Al Hossoun and Al Borj. Two swimming pools, a Spa with beauty treatments and massage and two hammams provide plenty of scope for rejuvenation and carefree relaxation. There are a number of suites and rooms to choose from. The management can arrange local trips and visits to the souks as well as riding, golf, hiking and tennis. Dar Zahia is a traditionally built four-bedroom guesthouse. Its clay walls reflect the medina’s historic architectural style, and its patio is brimming with lush jasmine plants. It is a haven of peace in the midst of the medina and close to the souks. Dar Zahia can arrange hiking or horseback riding excursions, or you can visit the nearby Turkish baths. Aziyade 358 Jnan si Moussa ,Derb Akka . Sip traditional Moroccan mint tea on the pink clay balconies here while taking in the Atlas mountain ranges. This small hotel of 3 rooms is only a few miles from the city’s markets, where guests can shop for local foods and crafts. Riad Tafilag is a traditional eight room riad located between the ramparts and the Medina. It has a swimming pool and panoramic terraces with tents. Riad Tafilag offers rooms with a private terrace and free Wi-Fi.The rooms are decorated with sculptures and Moroccan textiles. They are all air conditioned and some rooms and suites have access to the patio. Breakfast is served daily and can be taken on one of the four terraces. The riad also has a restaurant with a fireplace which serves traditional Moroccan cuisine. You can enjoy a traditional steam bath heated by a wood fire and a range of massages. Guests also have access to a large living room with satellite TV. Riad Tafilag is also close to the Assarag and Talmoklate squares and the souks. Bicycles are available free of charge. Riad Ain Khadra , Douar Ain El M’Diour. This riad has eight rooms.Located a 10-minute drive from the centre of Taroudant. Riad Ain Khadra offers a terrace with sun beds, an outdoor swimming pool and a spa, where you can enjoy the hammam, massages and body treatments. It provides guest rooms and suites, each traditionally decorated with warm colors. All of the rooms are heated and air-conditioned, and feature a private bathroom with a shower. Some of the rooms also have a seating area. 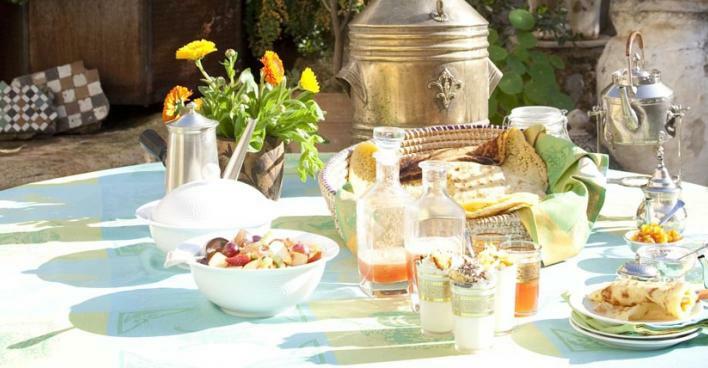 A typical Moroccan breakfast is included at Riad Ain Khadra and dinners with local specialities are also available. Meals are served in the dining room, on the patio, on the terrace or by the pool. The riad has free Wi-Fi in public areas. Transfers and excursions can be organized, with an extra cost. Free private parking is also possible on site and the palm grove of Tioute is 35 km away. Palais Oumensour , Borj Oumensour, Toudjent. Palais Oumensour is a 10-minute walk from the old Medina and the souks, and has a swimming pool in its garden, a terrace and a traditionally-decorated lounge with a TV corner and a library. The rooms and the suite at Palais Oumensour are air-conditioned and feature a view of the patio or the terrace. The private bathroom is fitted with a shower and includes a hairdryer. There are two superior suites and 4 junior rooms. A traditional breakfast is served every morning. Moroccan cuisine is available in the dining area which features a view of the Atlas Mountains. Other facilities are beauty and massage treatments, a steam bath and a hot tub, available at a surcharge. There is free Wi-Fi access in the public areas. Riad Jnane Ines, Douar Ain Lamdiour. It has eleven rooms and a large garden with an outdoor pool and lemon trees, this beautiful riad features a wellness centre featuring a jacuzzi, a hammam and massages are available on request. Guests can also relax on deckchairs by the pool. The riad offers typical Moroccan-style suites, some of them with a terrace. All of the spacious suites at Jnane Ines are air conditioned and equipped with a minibar and a private bathroom with bathtub. One of them has a panoramic view of Taroudant and a jacuzzi. Riad Jnane Ines’s restaurant provides daily breakfast and traditional cuisine from southern Morocco. Meals can be enjoyed on the terrace overlooking the pool. The wellness centre has a jacuzzi, a hammam and massages are available on request. The reception is open 24 hours and Jnane Ines provides free Wi-FI access in all public areas, including the common living room with couches. Free private parking is possible on site. Dar Fatima,Tasoukt Tighzifn, is a traditional Morrocan guesthouse and has 7 rooms. It is located in the heart of Taroudant’s Medina district. It features a hammam and a large patio with a fountain. The guest rooms at Dar Fatima all have private bathrooms and are decorated in a traditional style. Each is equipped with free Wi-Fi access. The guesthouse has a large lounge area, which has a TV with satellite channels and a fireplace. Guests can enjoy Morrocan specialities for lunch and dinner, along with a daily breakfast. Dar Fatima is just a few steps from the souks. The guesthouse provides a shuttle service to Agadir city centre on request, which is an hour away. An airport shuttle service is also available. Riad Taroudant has 16 Berber-style air conditioned rooms, with en-suite bathrooms. It is located in the midst of the Derb J’did quarter and offers guests a swimming pool for summer as well as open fireplaces for colder winter evenings, a sun-drenched roof terrace and a traditional Moroccan restaurant serving tagines, salads, couscous and kebabs. Riad Maia,12 Tassoukt Ighezifen. Riad Maïa has 3 guest rooms with an en-suite bathroom and 2 patios. Relax on the Riad’s terraces before indulging in a traditional massage. 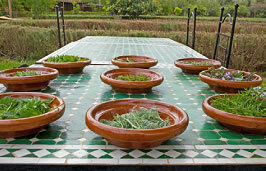 Moroccan cuisine courses can be booked directly at the Riad. Riad Maïa’s management can help organise excursions and 4 wheel drive trips to Marrakech or Ouarzazate. Hotel Dar Zitoune,Boutarialt El Barrania, Taroudant, is an environmentally conscious riad with 20 air conditioned Berber bungalows and suites with safety deposit box and bathroom. Beauty and body care services are available and guests can also relax in the outdoor swimming pool or heated hot tub. The restaurant offers a fusion of Moroccan and European cuisine which can also be served on the terrace or in the lounge bar. Dar Zitoune has a peaceful garden setting, just a few miles away from Taroudant. Fes is the culinary and cultural capital of Morocco. The world famous Fes Sacred Music Festival takes place 7-15 June and Dar Roumana’s restaurant at 30 Derb el Amer Zkak, Roumane in Fes Medina will be open every day offering pre-concert dinners from 6pm – 8pm Dar Roumana will be offering a smaller menu (2 starters, 2 mains and 2 desserts) for a reduced price of 300dh for three courses or 225dh for two courses. For those not attending the festival Dar Roumana’s usual dinner service will continue as normal from 7.30pm – 9pm. It is essential to book well beforehand during this busy period in Fes. Dinner is served in the patio and on the Dar Roumana terrace with spectacular views of the Fes medina and includes varied delicacies such as roasted beetroot, orange, mint and feta salad, spiced roasted quail with dried fruit orzo, moroccan fishcakes with cucumber and radish ribbon salad and sweet harissa dipping sauce, baked chicken thighs with honey, hazelnut and saffron with carrot and cumin mash. The garden restaurant attached to Riad Idrissy at 13 Derb Idrissi, Sieje, Sidi Ahmed Chaoui, is set in the romantic remains of a crumbling riad which has been turned into a delightful garden, with mosaic floors, fountains and exotic foliage. Lunch is prepared using fresh produce from the souk and includes salads – such as zaalouk (smoky aubergine, tomato and paprika puree) and tfaya (chickpeas, onions, raisins and cinnamon) – and street food, cooked to order in the garden, such as sardines marinated in chermoula (garlic, paprika, cumin, olive oil and lemon juice) with a polenta batter and makuda, spiced battered potato cakes. Afternoon tea is a blend of English and Moroccan, including tea made from homegrown mint and wormwood. After 7pm, the Fes garden is open for dinner by prior arrangement only, offering mechoui lamb (anything from a leg to a whole animal) cooked for seven hours over charcoal, Sephardic suppers and Roman banquets. The ruined garden at Riad Idrissy will operate as a festival green room – where artists, journalists and the audience can mingle between the Fes Sacred Music Festival concerts. Opening hours are between 12 noon and 9.30pm. There is also the great boon of no background music. Another great lunch and dinner venue is Palais Amani at 12 Derb el Miter, Oued Zhoune.This imposing Art Deco former palace has superb gardens Is known for excellent high class Moroccan cuisine and you can dine in the restaurant or the patio, booking is essential. La Maison Bleue, reservations also necessary at this elegant riad restaurant. The setting is intimate and romantic, with diners serenaded by an oud player (replaced by livelier Gnawa song and dance at the end of the evening). You’ll be treated to an array of cooked salads, tajines, couscous and bastilla (savoury pastries), plus filo pastry desserts. Restaurant Zagora just of the Southern end of Mohammed V in the Ville Nouvelle, this high class restaurant is popular with tour groups and locals alike. The wine list is probably the most extensive in the ville nouvelle and the menu includes international and Moroccan dishes and you get to be serenaded by a musician playing an oudh . The Majestic is close to the Royal Tennis Club et El Merja and the Marjane shopping centre offers refined upscale French cuisine and an excellent wine list. 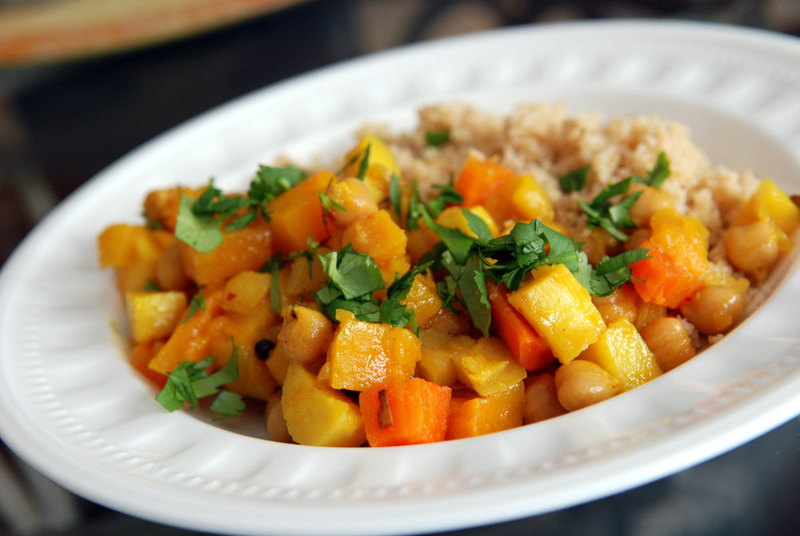 Morocco offers plenty of fulfilling options for vegetarian travelers . It has wonderful and abundant fresh vegetables and spices like cumin, saffron cinnamon and paprika and seasonal fruits which you will see piled high in local souks. For breakfast you will be offered bread with honey and jam and omelettes . You can also try Moroccan pancakes and crepes called malouai with honey which are often served in local cafes. Lunch is the main meal of the day and everything stops from noon to 3:00 p.m. Restaurants usually begin by serving a salad, which includes an array of vegetables such as tomatoes, onions, radishes, green peppers, beetroot and eggplant, with spices and herbs. The main course often consists of a tagine or couscous. A tagine is a slow-cooked stew served in an earthen ware pot and funnel shaped cover. 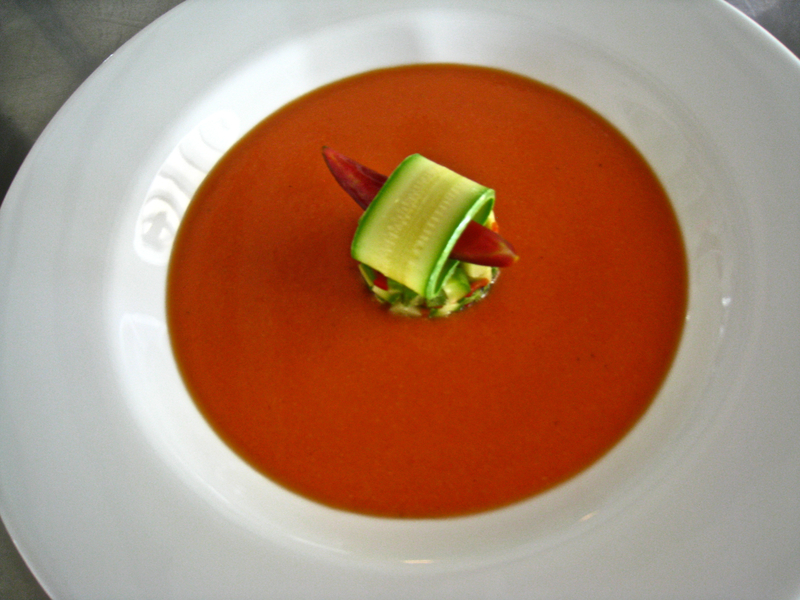 Restaurants in the main cities are now more aware of vegetarians and vegetable tangines are usually on the menu, but you need to make sure that they are not using a meat stock. Moroccan traditions do change to accommodate tourists but sometimes you have to make sure your requirements have been fully understood. Carry a phrase book in French and Moroccan Arabic. The same is also true for Morocco’s other favourite dish the couscous. 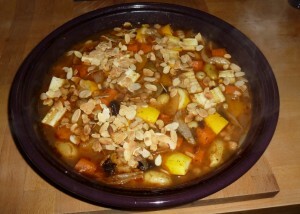 Couscous is semolina grains which are steamed above a pot of boiling vegetables. Pieces of meat are also included so vegetarians have to ensure that there is no meat in the couscous and no meat based stock. During Ramadan and other special occasions, harira with dates is served to break the fast. This nutritious and delicious soup has a tomato base and is thick with lentils, chickpeas and herbs. Harira is often made with vegetables but you will need to check beforehand with the restaurant to ensure that it is made without meat or meat based broth. Street food and restaurant appetizers also offer an array of meatless delights including olives and hummus, dried fruits, roasted nuts and b’sarra (white bean soup with olive oil and garlic). In Marrakech Earth Café is well known as an organic vegetarian and vegan restaurant and it is in the heart of the medina, just off the Jemaa el Fna square. They have six entrees, three of which are vegan at 60 dirhams [about 5 or 6 euros] for huge delicious portions. They also have good fresh juices. Chez Chegrouni also offers good vegetarian fare. Café des Epices and Terasse des Epices also offer excellent vegetarian meals as does the stylish Le Foundouk restaurant, not far from the Medersa Ben Youssef in the Medina. Riad 58 Blu is a charming riad which serves excellent vegetarian food to order and is open to non residents . Food needs to be ordered the night before. Pepe Nero is a high class riad restaurant with an impressive menu of Moroccan and Italian vegetarian dishes which need to be ordered the night before. Cuisine de Mona‘s serves superb Lebanese food and vegetarian dishes which can be enjoyed in the restaurant or as a take away. The restaurant is on an early turning off the route de Targa just before the three pizza restaurants on the right hand side. Lalla Mira is an organic and ‘eco’ restaurant, hotel and spa. La Petite Perle, a popular restaurant which serves good vegitarian dishes. Riad Dar Dmana is inside the medina and serves excellent vegetarian meals to its guests which need to be ordered the night before. Café Clock has several vegetarian and vegan dishes on its extensive menu and is a great meeting place in Fes for tourists, expats and locals. You are currently browsing the Travel-Exploration Blog blog archives for June, 2013.